Garden of Aaron: Trumpet Honeysuckle is One Sweet Vine! Trumpet Honeysuckle is One Sweet Vine! Every once in a while, I have a Gardening Idea that actually works out just as I intended. This happens fairly rarely, but when it does come to fruition, it's a good feeling. 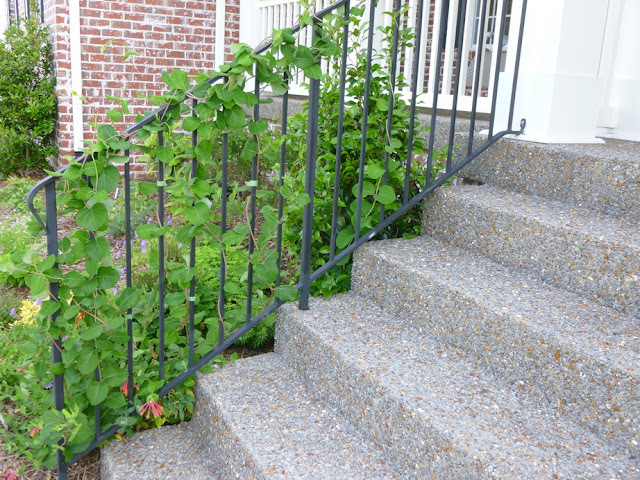 Last year, I had the idea of planting two native honeysuckle vines on either side of my porch steps and letting them twine up the metal railings so that visitors would be welcomed by cascading red flowers. 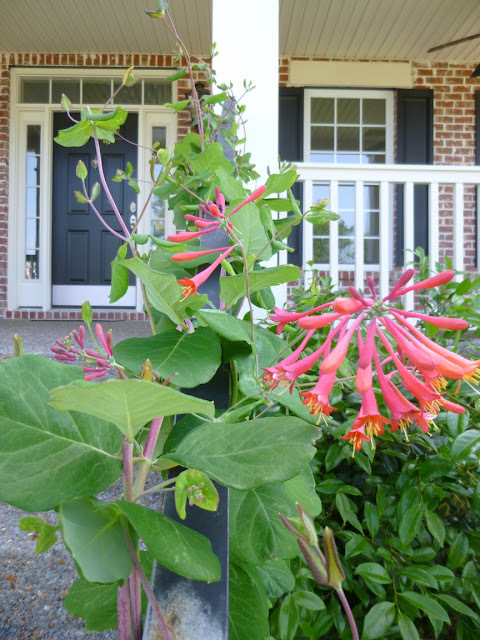 I'm NOT talking about invasive Japanese Honeysuckle, but the native Lonicera sempervirens, also known as Trumpet Honeysuckle. L. sempervirens is native to Tennessee and throughout the Eastern U.S.
You know that old adage about vines - the first year they sleep, the second year they creep, the third year they leap? Well, ours definitely slept the first year, growing perhaps 12-inches total but at least staying alive through awful heat (many 90-100+ summer days) and searing drought. On the other hand, it is cold hardy to zone 4. But I think they've skipped the creep stage and go right to LEAP. These days, they seem to grow about a foot or more per week. Here's a side-view of the vine climbing up the porch railing. 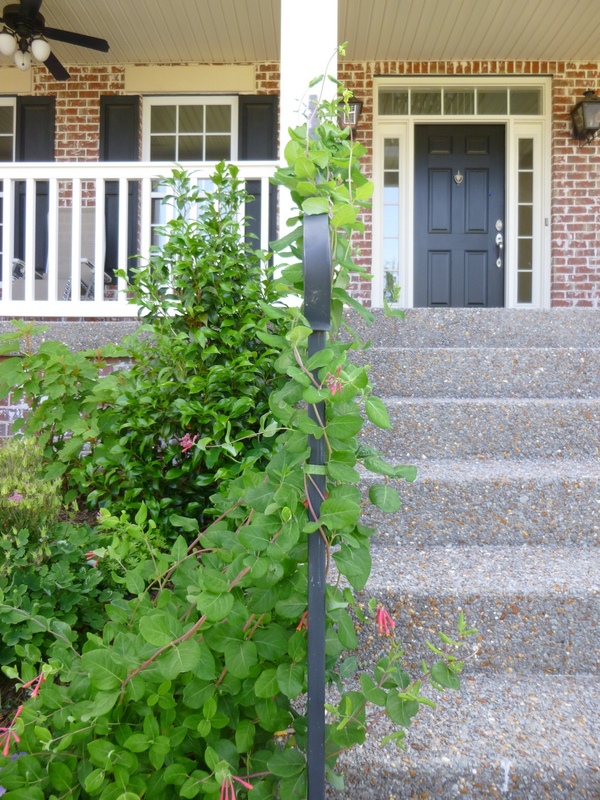 And just as I had hoped, the vines have twined (with a little bit of assistance and guidance) right up the porch railing. In fact, they're nearly at the top of that railing. I'm not sure what will happen next. I'll either try to keep them trimmed at the top of the railing or keep guiding them onto the porch and see how big they get. They're supposed to have a maximum length of 8-15 feet. I'd guess they're probably around 6-8 feet long right now, so I suppose they might be able to double their growth either this year or next. They also have a really long bloom season. We had a really cold spring -- one of our coldest springs on record - and Trumpet Honeysuckle was making buds in March and I believe started flowering in March or April. It flowers on old wood, so this year's main flush of blooms was not so huge, but it also flowers on new wood and there have been continuous small sprays of red flowers over the past two months with no sign of stopping. Unlike the invasive honeysuckle, L. sempervirens flowers are unscented. The buds and elongated flowers are both beautiful. My only source of sorrow is the fact that I have not yet seen any of the hummingbirds that L. sempervirens is supposed to attract. Maybe they'll come around next year if I get a larger flush of spring blooms on all the growth that's being added this year? Here's aclose-up of the flowers on the right-side railing from the "Blanche Sandman" Lonicera sempervirens, Trumpet Honeysuckle. What could make this picture perfect? Hummingbirds! L. sempervirens is also supposed to produce red berries that attract other birds. I don't recall seeing any berries last year, but I'll keep a closer eye out for them this year. Oh and I'd say the vine is partially to mostly evergreen here in Middle Tennessee. We had a fairly cold winter - not record cold, but long and cool - and L. sempervirens held on to most of its leaves all winter. I believe it drops the old leaves in the spring, but then leafs out almost immediate. L. sempervirens seems to be very wind-tolerant. We're on top of a small hill and the leaves and vines get buffeted pretty well as they climb the railing, but they don't seem to mind. It is also supposed to be drought-tolerant once established. I've heard it prefers full sun, but since our front porch (where I wanted the vines to grow) has Eastern exposure, it only gets sun all morning and very early afternoon and it still seems to grow just fine. Maybe I'd get more flowers if it were in Western exposure? The foliage has stayed pretty clean. Not pristine. There are a few holes here and there, but I don't spray any pesticides, and L. sempervirens - at least the two varieties I have - does not seem terribly bothered by any pests. Certainly nothing is slowing it down! I currently have "Alabama Crimson" growing on my left banister and "Blanche Sandman" on the right railing. I'd say both plants seem really similar so far, with Blanche Sandman perhaps flowering just a bit more. Other varieties that are supposed to be good include "John Clayton" (a bit more compact?) and "Major Wheeler". Based on my experience thus far, I'd highly recommend Trumpet Honeysuckle (Lonicera sempervirens) for any garden in the Eastern U.S.
As I drive along Tennessee roads and see empty fences surrounded by acres of lawn, I think how much nicer those fences would look covered in flowering trumpet honeysuckle vines and how many more hummingbirds we might have if their natural food supply was in greater abundance. Out, Out Damn (Cercospora Leaf) Spot!